Some of the most interesting artistic results have come to me through playing. The engineer in me wants to use the word “experimenting,” but if I’m honest, the artist in me really means “play”. 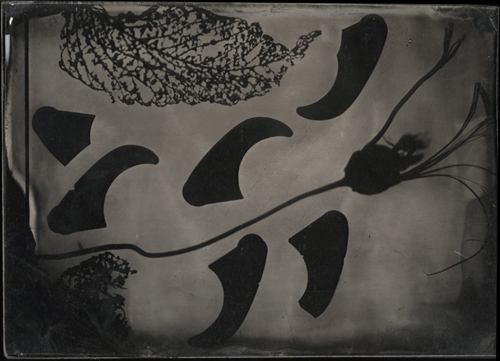 I’ve had a long fascination with photograms – objects placed on a light-sensitive surface then exposed. 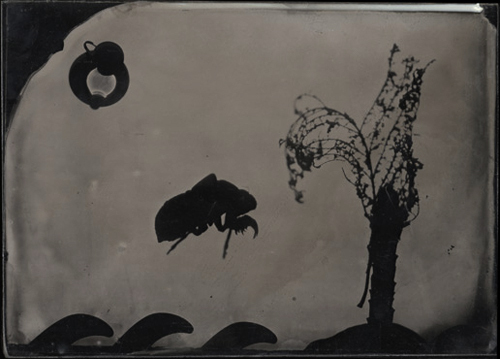 It’s impossible to do a contact print with collodion. 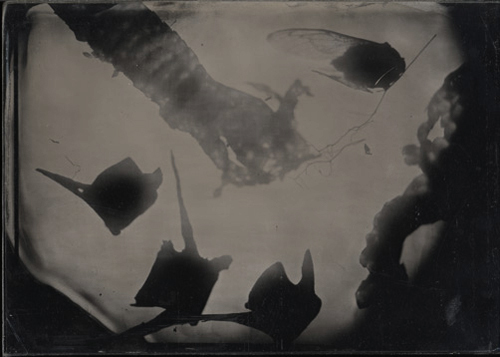 In normal in-camera collodion photography, salted collodion is flowed across a plate, and when firm (but still very wet), the coated plate is given a bath in silver nitrate for several minutes to create a light-sensitive solution. The plate is then placed in a plate holder and exposed in-camera. The surface can’t be touched by objects placed on the surface, because the image is literally made before the liquid dries. 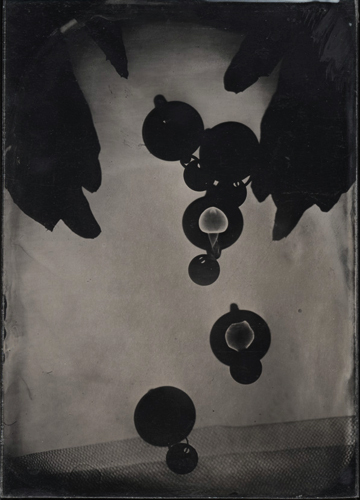 If you drag your finger across a plate – even after exposure – you drag the collodion and silver nitrate off the plate, and the image along with it. 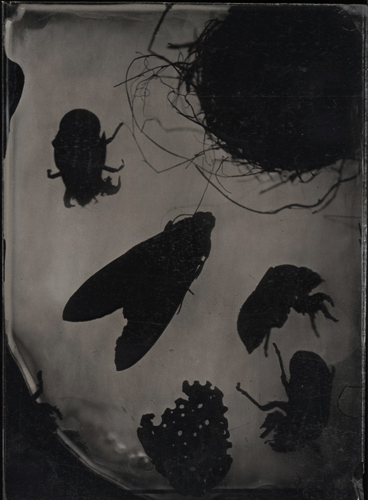 So a collodion contact print is impossible. The end. For years I’d been satisfied with this conclusion. One day out of inspiration, boredom, or maybe both, I finally asked, “What if…”. What if I built a clear platform just a little higher than the thickness of a coated plate? And what if I arranged objects on the clear platform instead of on the plate? And what if I didn’t use the camera or plate holder at all, but simply coated a plate and slid it under the platform directly under the objects? And what if I exposed the entire thing under a darkroom enlarger? 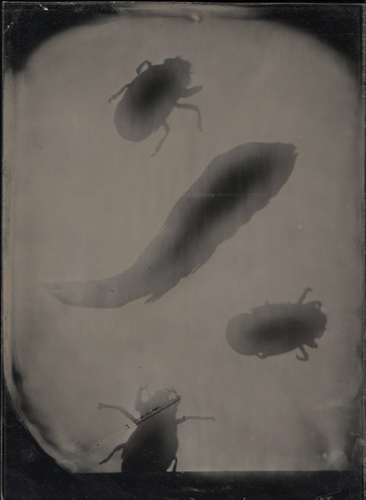 OK, so the results are still not photograms, or collodion contact prints. That can’t be done, remember! 🙂 But that’s not my point. I would never have thought about making any of these images without first asking myself, “What if”. What if we all asked “What if” more often? We may find ourselves making things that would have never existed otherwise! It doesn’t mean we’ll make better art, but we just might become better artists!